Namine was talking with her teacher on video chat some time ago, and I forget how, but the subject of bees came up. Ever since, Namine has wanted to have a bee party. Originally, the bee party wasn’t going to be in connection with Namine’s birthday; it was just going to be this standalone thing… a party with no real reason other than bees are pretty awesome. But while Namine had a birthday party over at my parents’ house, and she had a birthday tea party where she invited her friends, she never had one that all of our family could attend. So, the bee party turned into another birthday party. Namine never wavered from what she wanted, either. She never changed her mind about the party’s theme — even the cake. She had a clear idea in mind from the start. 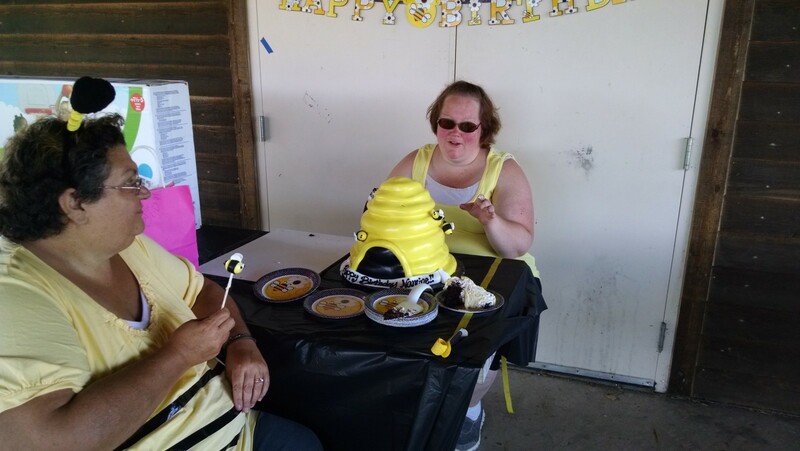 She described the cake as a beehive, with little bees on sticks sticking out of it, so it looked like they were buzzing around. The cake was so large, we had to remove a whole shelf to get it in the fridge. The one thing Jessica and I overrode was Namine’s idea for the meal. She originally just wanted to have honey sandwiches, and nothing else. We persuaded her to allow for a cookout, instead. There’s a park pretty close by to our apartment, and we rented its pavilion out for yesterday afternoon. I think this was our first time organizing this kind of thing, and we were not that organized. (We thought we were, but we were wrong.) So yesterday morning, while Jessica and I ran around like beheaded chickens, Namine contented herself with playing Teenage Mutant Ninja Turtles. When we got to the park, I must have made at least a dozen trips back and forth from the car to the pavilion. There weren’t any close parking spots, but we made do. I was very thankful for my parents and sister being there to help out. I had to run to the store to get ice, and Jessica was able to focus on grilling the hamburgers and hot dogs while they took care of the fruit and vegetables. Namine had been repeatedly asking to go play, but there was a lot to do. When I got back from the store, my sister was freed to take Namine over to the playground, but not before decorating her a little more. We had already dressed her in a striped bee shirt, but my sister had some washable colored hair spray. Add a bee headband, and she was all set. Namine’s cousin and her parents arrived just as the food was coming off the grill, so we sat down to eat. Namine’s interest was not in eating, though; it was in playing. There was a big playground just yonder, after all. It was calling her name. As Namine and her cousin climbed around the playground, I followed. I try not to be a helicopter parent, I really do, but I just wanted to be sure Namine wouldn’t fall and hurt herself. I needn’t have worried. When it was time to come back into the pavilion, Namine asked me to carry her back to her wheelchair. Scooting around on the wood chips was starting to take its toll on her legs and feet, and I’m sure she’ll be sporting all sorts of bruises later. Jessica and I had prepared a bunch of arts and crafts projects. The party was outside, but the weather forecast had predicted rain. The crafts were all bee-themed, of course. 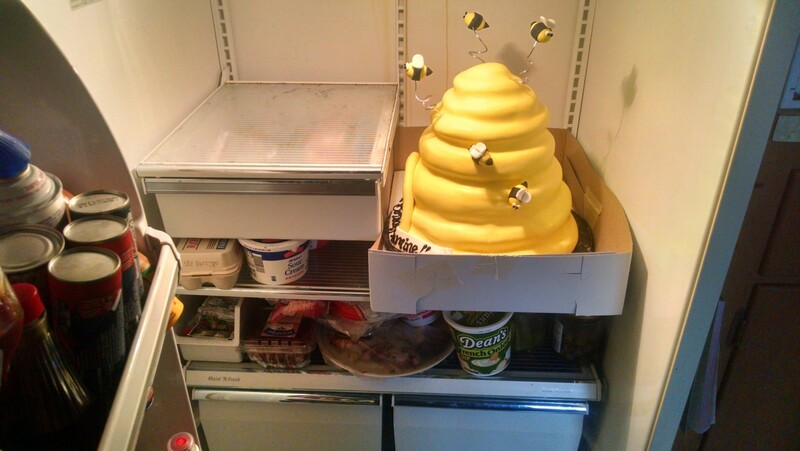 Namine’s bee cake was, in fact, several cakes. Four, I think, if I’m remembering what the ladies at the bakery told us, with a board in the middle to distribute weight, plus a cupcake on top. We had no idea how to cut it. "I have no idea how to cut this." 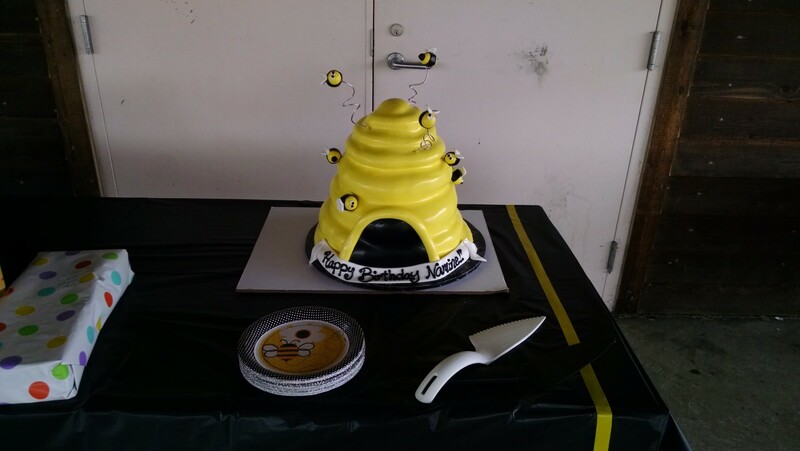 The sticks attaching the bees to the cake were of course not edible, but the bees were. They were made completely out of fondant, and man, were they sweet! I couldn’t finish my bee. Namine ate the wings off hers. As for the cake itself, it was made up of stripes of white and chocolate cake, with a delicious buttercream frosting (an inch thick!) covered in fondant. I don’t think anyone actually finished their pieces of cake, they were so, so sweet. After we had more or less finished our cake (although to me, it felt more like the cake had finished me off), Namine got to open her presents. The first two presents, Namine already knew about, but had agreed to wait for. They were a basketball and hoop. Jessica and I still had a few things to give her, and once we’d decided that the bee party was, in fact, another birthday party, we had decided to hold off on giving them to her. 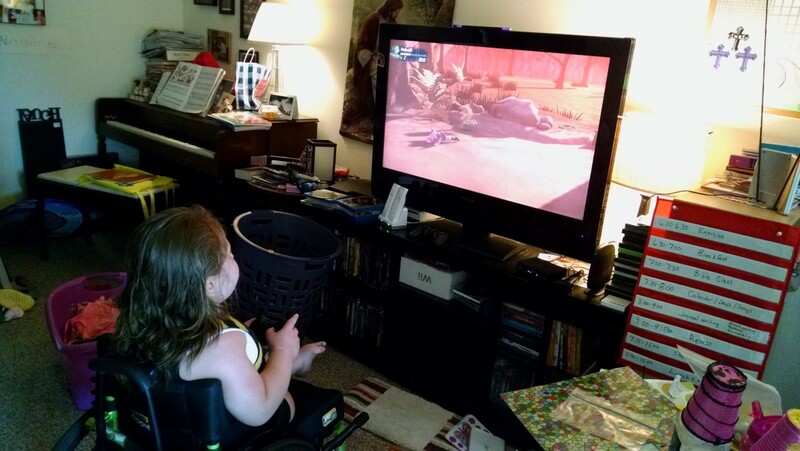 Namine absolutely loves the American Girl doll that my mom had given her (the doll is in a wheelchair, and Namine gives her encouragement, like her own therapist encourages her when she’s in her walker). Jessica had gone to an American Girl sale with a couple of her sisters, and had gotten a bunch of clothes for the doll. Namine got a bunch of other cool stuff — clothes and toys, temporary tattoos, and an Elsa doll. She also got a decorative bee to put in her room.